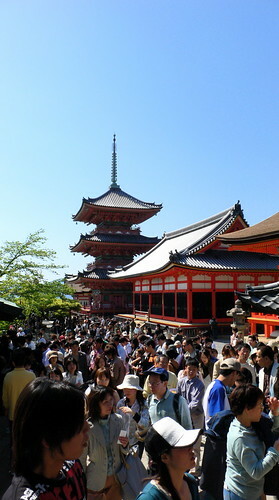 Kiyomizudera, founded in 788, is one of the most famous temples in Kyoto. People come here to pray to the eleven-headed Kannon statue that is only shown publicly once every 33 years. 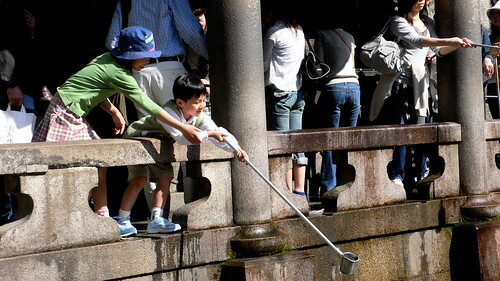 Needless to say, since it was a beautiful Spring day during Golden Week, Kiyomizudera was packed. 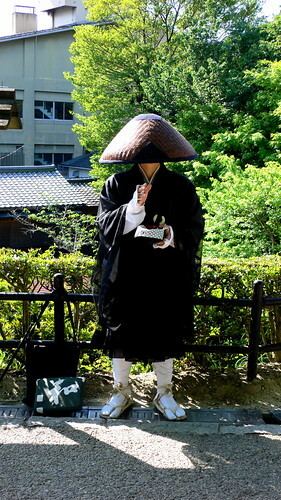 Strangely, however, I enjoy Japanese crowds. Because Japan’s urban areas are so densely populated it seems that most Japanese people are quite comfortable in crowded conditions and you don’t end up with the kind of “angry crowd” phenomenon you seem to get so much of in the States. In fact, the crowded approach to the temple simply lent a jostling sense of excitement to the whole thing. We had become pilgrimatic Brownian motion. 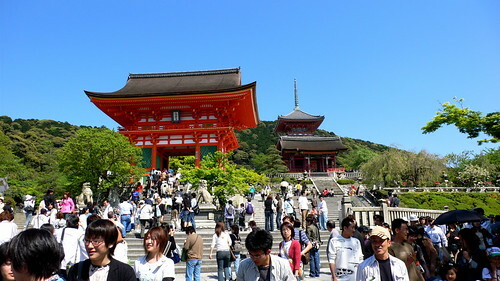 This is the main approach to Kiyomizudera. I’m not sure whether the orange buildings are actually a part of Kiyomizudera proper, or a part of Jishu Shrine, a separate shrine complex. Apparently, Jishu Shrine is a love shrine dedicated to “the cupid of Japan.” Jess and I didn’t enter the shrine itself, but there are two “love stones,” some 10 meters apart, and you are supposed to be guaranteed eternal bliss if you can walk from the one to the other while murmuring (or muttering?) the name of the one you love. A closer view of the entry gate. 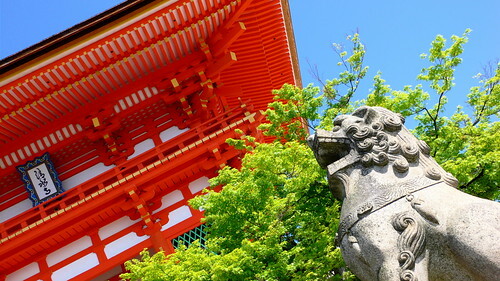 This is the view to your right as you approach the main entrance to Kiyomizudera. If you look closely you can see a pagoda peeking out from the trees off in the distance. 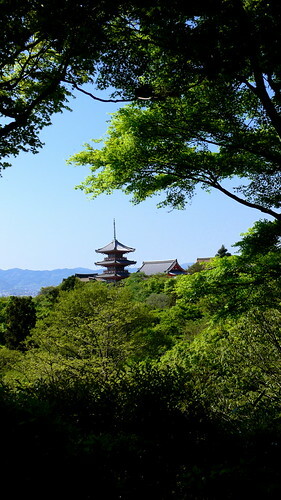 This is a view looking back from the main entrance of Kiyomizudera. 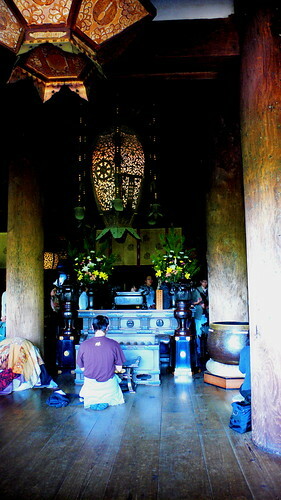 A worshipper praying in the main hall. There was a long line of people waiting to ring the bell and then pray in front of the altar. I’m not positive, but I expect that the eleven-headed Kannon is enshrined here. 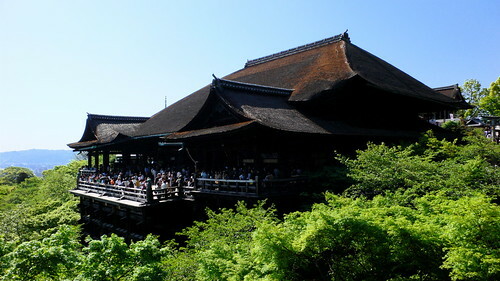 Here’s a view of Kiyomizudera’s second largest hall, taken from the veranda of the main hall. 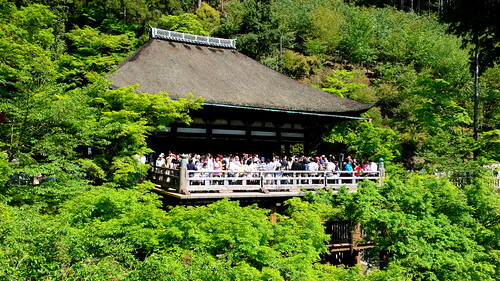 If you look at the large version, you can see that the veranda is sardined with people. 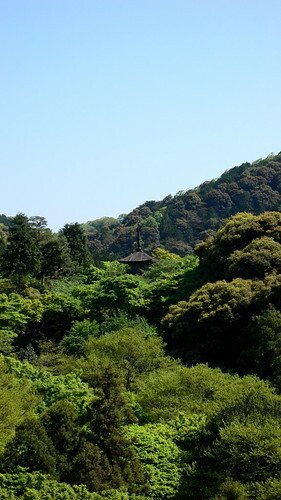 A view of Kiyomizudera taken from the approach to the small mountain pagoda. 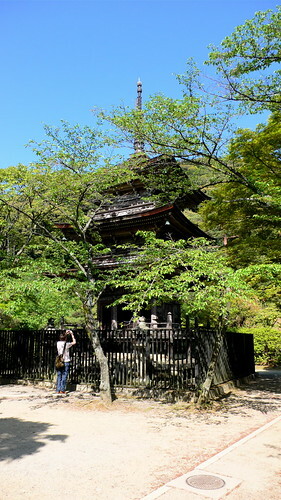 The pagoda itself is actually smaller than it seems at a distance. That’s Jess on the bottom, taking a snap of it. 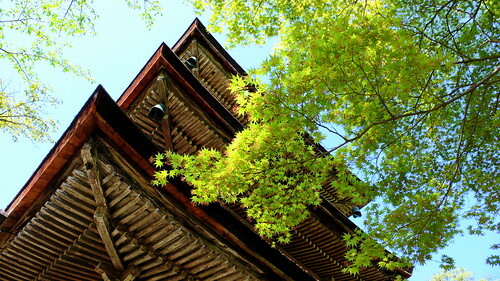 A view of the pagoda’s woodwork, with spring foliage. 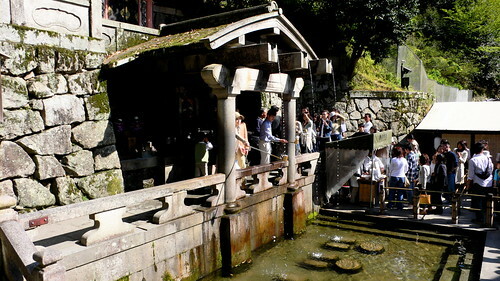 Kiyomizu literally means “pure water” and the sacred spring ends here at the Otowa-no-taki, a small waterfall where visitors drink the sacred waters, which are supposed to have therapeutic properties. Kids having fun with therapy.